Microsoft has been indicating for a while that they intended to change the Conference climate for their customers and partners. Convergence was always a great conference for first hand exposure to Dynamics products and team members, though slowly the event was changing. Last year’s explosion of vendors in the expo hall that had little to no relationship to Dynamics was a clue of what might to come. IBM and HP sponsorship, Office365 and Azure making strong appearances all pointed to a new direction. Along with a popular Microsoft Ignite conference series, it was only a matter of time until Convergence was officially rebranded. Announced today Microsoft Envision is the new flagship event for business leaders. 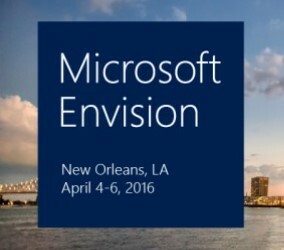 Microsoft Envision will take place in New Orleans April 4-6, 2016… and registration is now open! It’s part of Microsoft’s lineup of global flagship events which also includes Microsoft Ignite for the IT professionals, Microsoft’s Worldwide Partner Conference for partners, and Microsoft //Build for developers which opens registration on January 19. Microsoft Envision replaces Microsoft Convergence as the premier event for business leaders and Microsoft Dynamics technical content will move to Microsoft Ignite. I expect attendance at Envision to drop compared to Convergence, and events like AXUG Summit to grow by leaps and bounds.